This artist's concept shows some of the most notable small planets NASA’s Kepler space telescope has discovered. NASA's planet-hunting Kepler space telescope continues to zero in on the first "alien Earth" despite being hobbled by a malfunction more than two years ago. Last Thursday (July 23), mission scientists announced the discovery of Kepler-452b, which they and NASA officials described as the most Earth-like exoplanet yet found. Kepler-452b circles a sunlike star at about the same distance Earth orbits the sun, but the alien world is about 60 percent wider than our home planet, so it's not a true "Earth twin." While the discovery of Kepler-452b is new, the observations that led to it are several years old. The planet was dug out of data Kepler gathered during the first four years of its original planet hunt, which came to an end in 2013. The main goal of the $600 million Kepler mission is to determine how common Earth-like planets are across the Milky Way galaxy. During its original round of operations, the Kepler spacecraft stared at more than 150,000 stars continuously and simultaneously, watching for tiny brightness dips that could betray the presence of a planet crossing, or "transiting," its host star's face. This work required extremely precise pointing, an ability Kepler lost when the second of its four orientation-maintaining reaction wheels failed in May 2013. Kepler generally needs to observe multiple transits to detect a planet, so it can take a while for the observatory to spot a potentially habitable world. (Earth, after all, would transit the sun from a hypothetical alien Kepler's perspective just once a year.) Small, rocky planets also present a signal-to-noise issue that can be mitigated by observing multiple transits. Kepler team members have therefore long maintained that the most interesting Kepler finds should come at relatively late stages in the mission. So, while Kepler observed beyond the 3.5 years prescribed by the prime mission plan, the failure of the second reaction wheel was initially "crushing," Jenkins said. But only initially, for Kepler scientists have gotten better and better at analyzing the observatory's huge dataset and pulling out intriguing finds from the original planet hunt, team members said. The exoplanet Kepler-452b is a planet very much like and the closest cousin or twin to our planet yet found. See all about planet Kepler-452b in our full infographic. 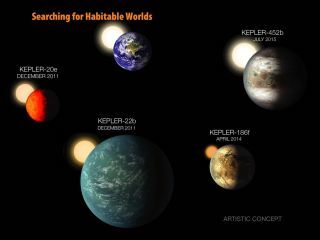 Furthermore, 11 of the newly detected 521 candidates are similar to Kepler-452b: They're less than twice Earth's diameter and reside in their host stars' "habitable zone," that just-right range of distances in which liquid water could exist on a planet's surface. Such detections were made with the aid of new software that automated some parts of the data-analysis process that had previously been done manually, said Kepler research scientist Jeff Coughlin, of the Search for Extraterrestrial Intelligence (SETI) Institute in Mountain View, California. Continued improvements in software and analysis techniques should result in more discoveries down the road, Coughlin added. Indeed, he said, the team plans to release another "catalog" of Kepler finds next year. "We're really optimistic that we're going to continue to discover even more small, habitable-zone planets," Coughlin said during Thursday's news conference. Kepler's enormous dataset is publicly archived, so it should give academics and citizen scientists plenty to chew on far into the future, he added. "I really expect that discoveries will be coming from Kepler for the next several decades," Coughlin said. Regardless of what happens in the future, Kepler's discoveries have already revolutionized exoplanet research. The spacecraft's finds suggest, among other things, that every Milky Way star hosts at least one planet on average; that rocky planets are extremely common throughout the galaxy; and that about 20 percent of all stars in the Milky Way host a roughly Earth-size planet in their habitable zones. And while team members pore over data from the original mission, Kepler continues to gather data during a new mission called K2. The observatory's handlers figured out a way to improve its pointing abilities using sunlight pressure as a sort of ersatz reaction wheel, and Kepler is now studying a variety of cosmic objects and phenomena, from distant supernova explosions to comets and asteroids in our own solar system. The failure of the second reaction wheel "is kind of the best worst thing that could've ever happened to Kepler," Jenkins said. "It really broadens the field of exoplanets. It broadens the science that we can do with this phenomenal spacecraft."